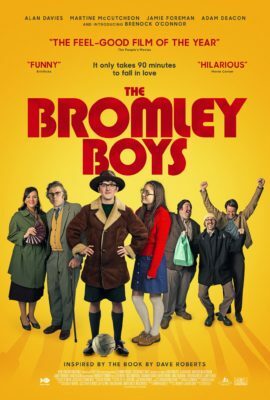 The Bromley Boys is a comedy straight from Britain with a very tongue in cheek comedic style that lands most of the time. The film follows Dave, a young man whose love for his favourite football (soccer for the North American audience) team goes above and beyond a simple hobby. The films greatest strengths are its performances of its real-life counterparts. Brenock O’Connor’s portrayal of Dave as such an empathetic character whose love for his team, Bromley FC, is adorable to witness. Don’t mistake it thought, his love is very unhealthy, however, but it still comes off as such a lovable story that it carries through till the end, especially in one of its final scenes. There are many instances though that stop it from being a great film, mainly its pacing. Yet doesn’t warrant passing on it. All in all, The Bromley Boys is a cute story about a young man’s love for his sport and that in itself shines brightly.